Ask Jennifer Adams: Are nightstands essential bedroom furniture for a spare, minimal look? Use low-slug nightstands for low beds. Q: My fiance and I have moved into our first apartment together, and neither of us likes a lot of furniture. We pretty much live on floor pillows, and our bed sits right on the floor. It's also easy for our dog to sleep with us because he doesn't need to climb up. My question is: What do you suggest for some kind of nightstands? I don't want my eyeglasses and phone on the rug anymore as the static from the carpet makes the little threads stick to everything. A: How fun to be setting up your first apartment, and congratulations on your engagement. It's great that you two agree on the look of your place and are working to make it all your own, especially for your bedroom. I can imagine how carpet or area rug fibers would be attracted to phones and your eyeglasses, all the things you would want to keep clean. As long as you don't need the extra storage, you could get very creative with ways to get the nightstand function without a real nightstand. Consider the important functions of just the top of a nightstand. 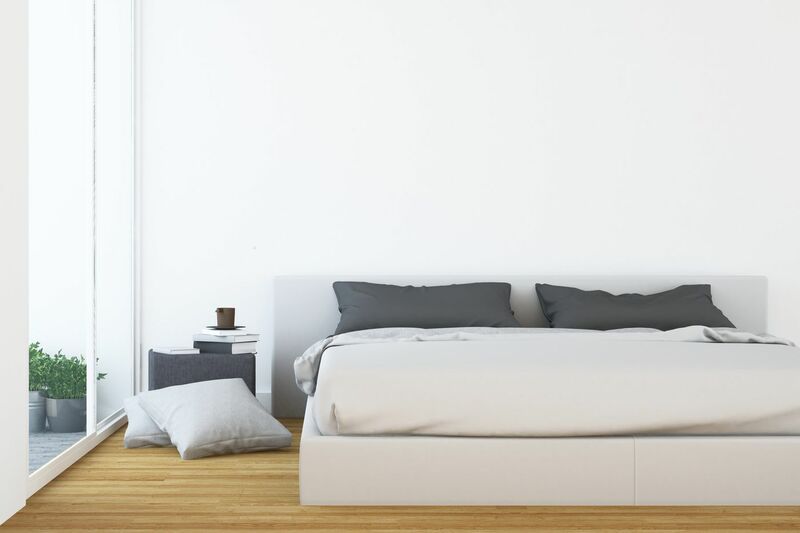 Lay out the possessions you like to keep near your bed, and see how much room you really need. A simple wooden or bamboo tray or framed mirror could be a good way to keep your things organized and clean. It doesn't even need to be made of wood. Even metal vintage signs, a large stone tile or a plastic or ceramic platter in a color you like will work just as well. You could also look for low storage boxes or baskets that you could turn upside down or sideways, or add a low shelf along the wall. Keep in mind that whatever you use should be sturdy enough for a lamp to not tip over. Use a plank of reclaimed wood, a piece of glass, or a tray as a top if you need a little more surface area. For the sleekest, minimal look, try to keep the overall height of your "nightstand" similar to, or lower than, the height of your mattress. Hope this is helpful, and please share what you find!